One of my very few complaints about living in Muskoka is the lack of elevation. After getting used to the enormous backdrops and surreal vistas of the western mountains, the relative flatness of the Canadian Shield makes me yearn for steep cliffs and endless slopes, especially in the winter. Every once in a while though, I'm reminded that there's still a whole lot of up and down fun to be had in Muskoka. 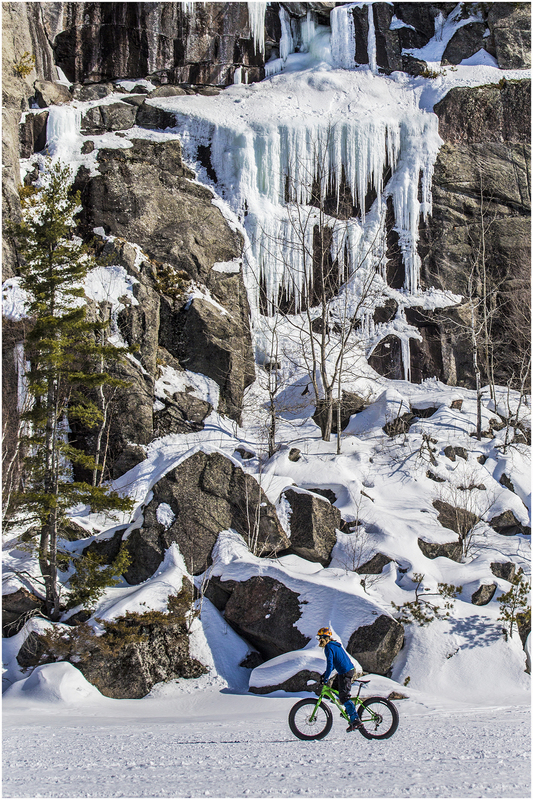 Earlier this month, I went for an ice climbing photo expedition for Peter DeMos from Muskoka Outfitters on Raven Lake, just east of Dorset. 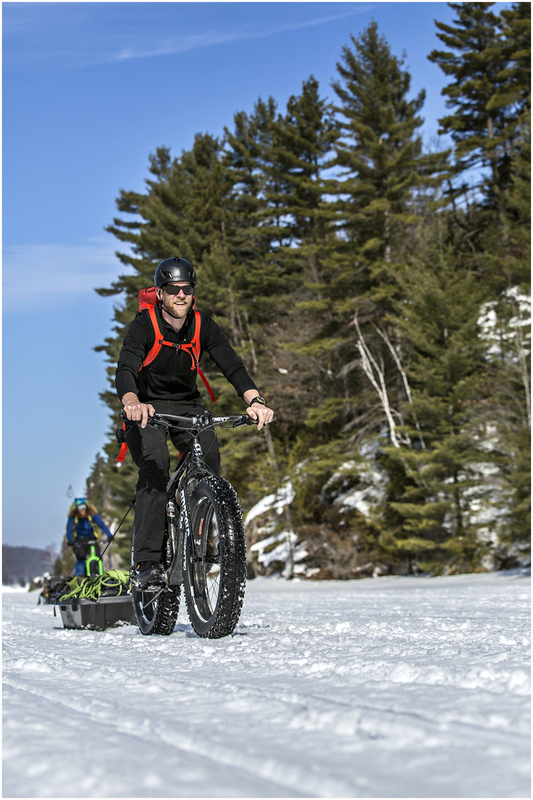 We rode out to an icefall called Hungry Man on fat bikes, which have oversized, under-inflated tires for riding on snow. While I've never been big into rock climbing (too much shutter-finger strain!) ice climbing has always been really appealing. With spiky crampons on your feet and impossibly light axes in your hands, you get a definite super-hero feeling as you scale up the ice. Most fun though, is the rappelling back down - you jump your way down the ice, suspended by your harness and the person belaying the safety rope below. See the photo of John (in orange pants) below to get an idea. Our day out on Raven was spectacular - blue skies, some of the warmest temperatures in months, and great climbing despite a lot of "sun-rot" on the ice falls. Huge thanks to Peter and Alex from Muskoka Outfitters for organizing such a dynamite day! You can go on your own ice-climbing expedition with them - check out the details here! Also along for the climb that day was my friend Andy from Pure Muskoka, who does amazing video and photo work. Andy's got a drone with a GoPro attached that he flies expertly, and to me is redefining what the landscapes in Muskoka can look like. Check out the video he made of the day below, see his full blog post here, and if you haven't already, like the Pure Muskoka Facebook page!